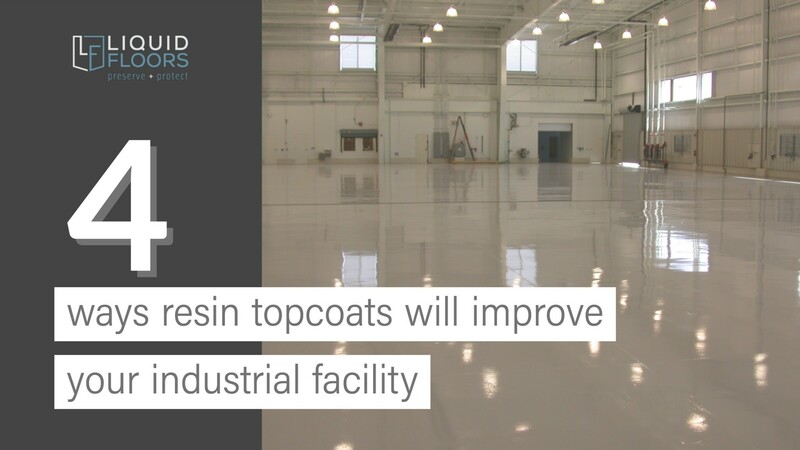 Epoxy floor coatings with improve the appearance, longevity and durability of many types of industrial facilities. When Liquid Floors installs epoxy floor coatings, we often suggest an additional layer of clear epoxy resin in the form of Clear Resin Topcoats in order to further protect and beautify your new liquid floor. Clear resin topcoats provide an additional layer of protection and durability to almost any resin based floor surface. Here are a number of benefits your floor will enjoy as a result of an additional clear resin topcoat. One benefit your floor will receive from an additional coding of clear epoxy resin may be improved slip resistance. This is achieved I combining the clear resin with other materials like a fine aggregate. This combination will improve safety of your facility and protect your employees and visitors from dangerous slips and falls. A clear resin topcoat can also provide improved durability. The extra layer of clear resin is just another protective barrier between the elements and traffic that your facility is constantly throwing at your floors. It serves as a shield of sorts allowing your floor to last longer then it would without the extra coat of resin. Finally, depending on the sheen, an extra layer of clear epoxy resin can improve the reflectivity and glossy look of your flooring. This, in turn, can make your facility look lighter and brighter and more beautiful. Alternatively, We can use a matte finish to prevent glare in facilities where less glare is preferred. Liquid fFoors has been installing Epoxy Floor Coatings as well as clear resin top coats for over 20 years. We only work with industrial clients and we are the industrial flooring experts. Don’t trust anyone else with your critical industrial flooring needs. Liquid QuickTalks: What is Diamond Grinding? Why Epoxy Flooring is the Best Solution for the Manufacturing Industry?